Many of us at Moosewood “put up” Dilly Beans during the summer and then conjure up fond memories of the vegetable garden as we eat them during the winter. These intensely flavored beans can be prepared on the spot anytime. Serve as a garnish for green salads or as a side dish with sandwiches or frittatas. Bring the water to a boil in a small pot. Cook the beans, covered, for 3 to 5 minutes. Drain the beans when they are still bright green and just tender, and place them in a bowl. Stir the dill into the warm beans. Combine the garlic, red pepper flakes, vinegar, and sugar or honey in a saucepan and quickly bring to a boil. Simmer for 2 minutes. Pour the dressing over the green beans and mix well. Add the oil if you like. Serve immediately, or chill for about 20 minutes and serve later. 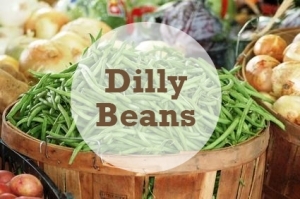 Covered and refrigerated, Dilly Beans will keep for 4 days. Reprinted with permission from the Moosewood Collective, from Moosewood Restaurant Cooks at Home, Fast and Easy Recipes for Any Day; Copyright 1994 by Moosewood, Inc., Simon & Schuster/Fireside publishers, New York.